Sorry it’s been quiet round these parts – usual hobby curse of busy living, plus some lovely weather and jumping around between project – so plenty of producing, very little produced. I have, however, been thoroughly excited by the new Horizon Wars rules from Osprey. 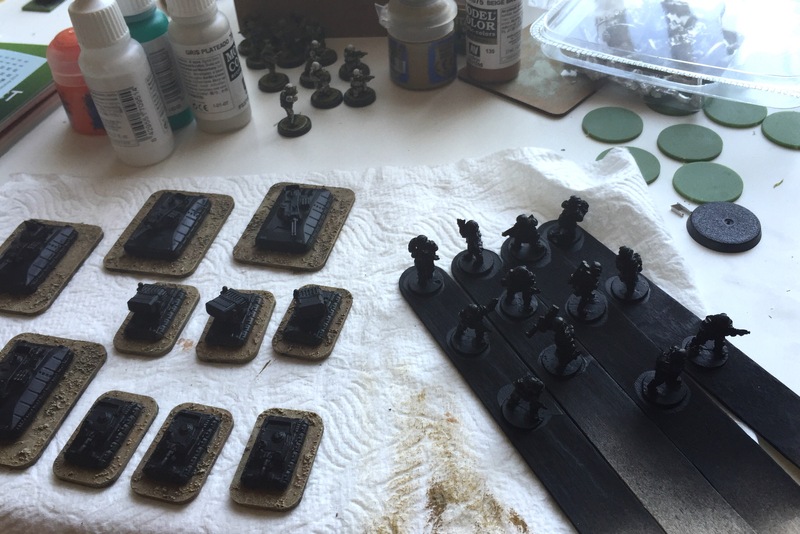 They cover a ‘scale’ of conflict I’ve wanted to game for ages (reinforced platoon in 6mm), so *hopefully* you’ll see a finished (that’s right!) 20P hover tank force (the points value in Horizon Wars is Presence, or P). An extensively converted Ungor warband for my Chaos Wastes project that will also double up as a Frostgrave force. More 15mm Sci Fi – I’m hankering to do some stuff with HO cars as burnt out wrecks, so my current 15mm tinkering has a near future/hard sci-fi/post-apocalypse vibe. More Inq28 stuff, though that’s progressing very slowly. Hopefully I can show off the tanks tonight. Yup – always been terrible for it. I’m mostly a solo gamer, so don’t have anyone forcing me to do anything. Ho hum, it’s all fun!